Former Messiah College student Brooke Strayer giving a presentation on the history of the Brethren in Christ peace position at the 2014 Conference on Faith and History undergraduate research conference. 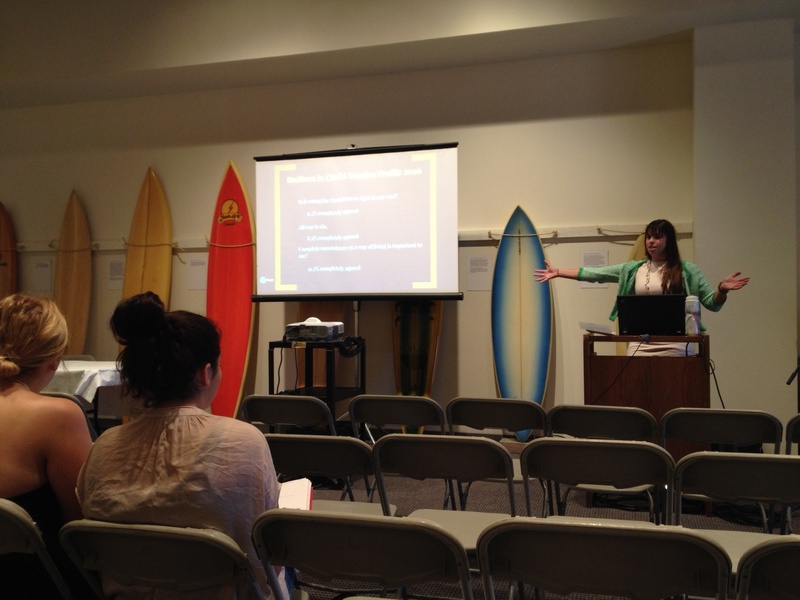 Yes, those are surfboards behind her — she’s presenting in the Pepperdine University Surfboard Museum! My former Messiah College student Brooke Strayer has been knocking it out of the park recently. Today, I had the pleasure of hearing Brooke present her research again, as part of the undergraduate research conference of the 2014 Conference on Faith and History. (Readers will also know that I’m in Malibu, California for the next two days to participate in the main CFH conference.) I was impressed by Brooke’s presentation. She did not read her paper verbatim (she later told me she would bore herself if she read the paper word for word!) like most people do at academic conferences. Instead, she spoke with notes and even threw in some personal asides during her talk. Brooke also answered audience questions with a lot of wisdom and poise. As my Messiah College colleague (and Brooke’s former academic advisor) John Fea commented to her after her talk, Brooke walks the fine line between historian and activist. She sees the history of the Brethren in Christ as a “usable past” for those who want to promote the peace tradition in our churches today — meaning that we can learn a lot from the good (and bad) ways that Brethren in Christ have practiced peace in the past. Yet she is clear that we cannot simply revert back to an earlier age. I think we need more “historical activists” like Brooke!